Anstoss 3 is a simulation of the career of a football manager. You can play in 22 ligues of 11 countries and lead your team from the depth of the 3. ligue to the championship. In Anstoss 3 you can manage everything, from the intensity of the training to the expansion of your stadium (from the sausage stands to the sky scrapers around the stadiuma area). 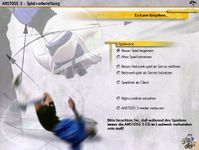 You can watch the matches in 3D or in a text mode. Anstoss 3 is not offically licensed and so does not have the real names of the clubs and players but Anstoss does include an editor.